The name of Toronto has a history distinct from that of the city itself. Originally, the term “Taronto” referred to a channel of water between Lake Simcoe and Lake Couchiching, but in time the name passed southward, and was eventually applied to a new fort at the mouth of the Humber River. Fort Toronto was the first settlement in the area, and lent its name to what became the city of Toronto. Originally, the term “Toronto” referred to Matchedash Bay, and was recorded with various spellings in French and English, including Tarento, Tarontha, Taronto, Toranto, Torento, Toronto, and Toronton. “Taronto” later referred to “The Narrows”, a channel of water through which Lake Simcoe discharges into Lake Couchiching. This narrows was styled tkaronto by the Mohawk, meaning “where there are trees standing in the water”, and was recorded as early as 1615 by Samuel de Champlain. Today the area is partially surrounded by trees with marinas and includes the national historic site of the Mnjikaning Fish Weirs. by 1686, Passage de Taronto referred to a canoe route tracking what is now the Humber River. The river became known as Rivière Taronto as the canoe route became more popular with French explorers, and by the 1720s a fort to the east of the delta on Lake Ontario was named by the French Fort Toronto. Rivière Taronto was renamed to Humber River by Simcoe. The change of spelling from Taronto to Toronto is thought to originate on a 1695 map by Italian cartographer Vincenzo Coronelli. The story of the Taronto Passage and the Toronto Carrying Place Trail and the Fish Weirs in the Narrows between Lake Simcoe and Lake Couchiching is told in pieces at various sites. Taronto originally referred to the Narrows where trees grew in the water. The word then came to refer to the whole lake. 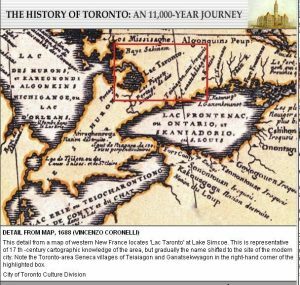 Then it referenced the passage-portage route between Lake Ontario and Lake Simcoe and finally came to reference the city that was built at the southern end of the passage. The Mnjikaning Fish Weirs are one of the oldest human developments in Canada. These fishing weirs were built by the first nations people well before recorded history: so far back that they actually pre-date the Great Pyramid of Cheops in Giza (erected 2560 BC) according to carbon dating done on some of the wooden remnants. The weirs were built in the narrows between Lake Couchiching and Lake Simcoe where today’s Ontario Highway 12 passes over. They were preserved by the water and layers of protective silt. The weirs were built as fences to help encircle the various fish species that would faithfully end up within the traps. These early fishermen wove brush and vegetation among the weirs to make net-like fencing where the fish were guided to be speared, netted or kept for later use. They were in use for 5000 years, right up until World War II. Champlain noted their existence on Sept 1, 1615, when he passed here with the Huron en route to the battle with the Iroquois on the south east side of Lake Ontario. Copyright © Ramara Historical Society. Website Hosted by: Orillia Pro Net Inc.